Win a free copy of the “Rules of Hell” Box set! It’s giveaway time again! This coming Tuesday is the US release date for the Black Sabbath Box Set “The Rules of Hell”. 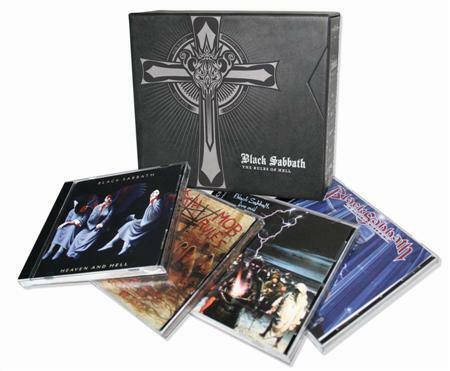 If you’ve been living under a rock, then you don’t know this is the Dio era of Black Sabbath’s remastered box set offering. It contains the three studio albums Dio Sabbath released, plus the tepid live release, “Live Evil”. This is the first time these albums have been remastered from the original Warner Bros source masters (the 1996 Castle versions were a different source master). I’ve had a pre-release copy in my hands for a few weeks now, and I have to say, they sound improvement is quite noticeable (especially on H&H and MR), but I’ll have a full review later. The painting used for the cover of the Heaven & Hell album was not originally created for the album. What was that painting’s original name? What was the name of the artist that painted the cover art for The Mob Rules album? Name the two theatrical movies that the Dio era of Black Sabbath contributed songs to. Which song from Dehumanizer was the only track to be played live on the 1994 Cross Purposes tour with Tony Martin? What is Ronnie James Dio’s real surname? You need to send your answers for the questions and your name and address to roh@black-sabbath.com. There’s two important things here. First the email must go to this address. Second, you have to include your name and address. IF YOU FAIL TO COMPLY WITH THESE TWO SIMPLE INSTRUCTIONS, YOUR SUBMISSION WILL NOT BE CONSIDERED. The contest will run through Tuesday the 22nd of July at noon (my time, which is the Central Time Zone in the US). You don’t have to be in the US to be eligible to win. A few notes about other versions of box set I should point out. It appears that the digital distributions of the Rules of Hell box set include more material than the physical version. I’m referring to the versions that appear on places like iTunes and the Amazon MP3 store. These two versions also include the three new tracks from the Dio Years set (Devil Cried, Shadow of the Wind, & Ear in the Wall). I’m attempting to find out if these will be on the physical version, but I do not believe they are. Confirmed. Rhino told me this afternoon that these tracks appear on digital versions only. The Best Buy version has a limited edition exclusive bonus disc, which contains five live tracks, culled from last year’s “Live at Hammersmith” release. More details available here.